Open up the View administrator, navigate to View Configuration > servers. Select your Server and click the Edit button. On Select Authenticator Select New. Update the fields with your information. 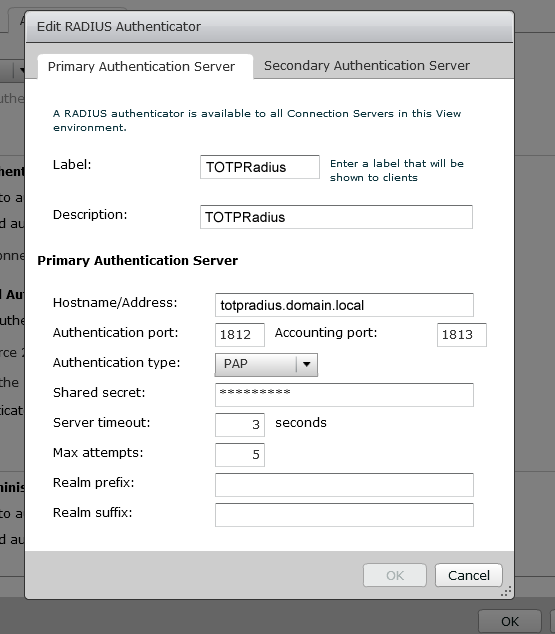 Set the hostname/address field to point to your TOTPRadius appliance. We are now done with the View Configuration. Enter your passcode generated by the mobile app or the hardware token, and if setup correctly you will be prompted for your domain credentials. Please note that there is no self-enrollment possible with this configuration, so you may want to set the initial login allowance to zero.